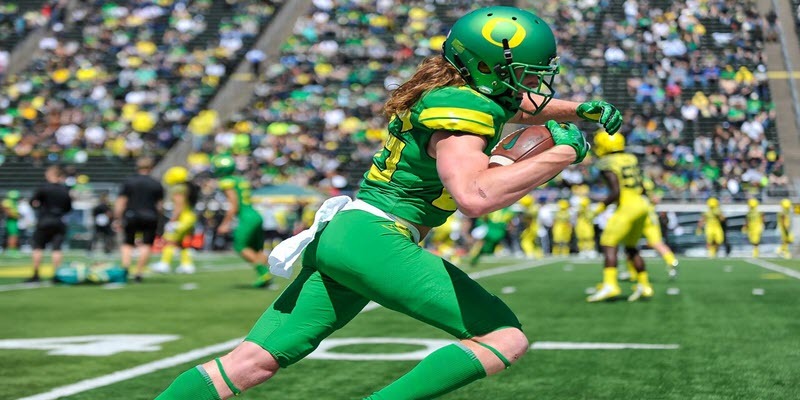 Throughout the spring, we have received a few clues as to what the Oregon Duck offense will look like under new head man Mario Cristobal and new offensive coordinator Marcus Arroyo. Taking these clues, we can make several educated guesses as to what we’ll see come payoff time this fall. Today I want to look at how Cristobal may use wide receiver sets and alignments is his offense. Willie Taggart introduced Oregon to what was known as the Baylor split in college football. This is the very extreme receiver split used by Baylor University under former coach Art Briles. 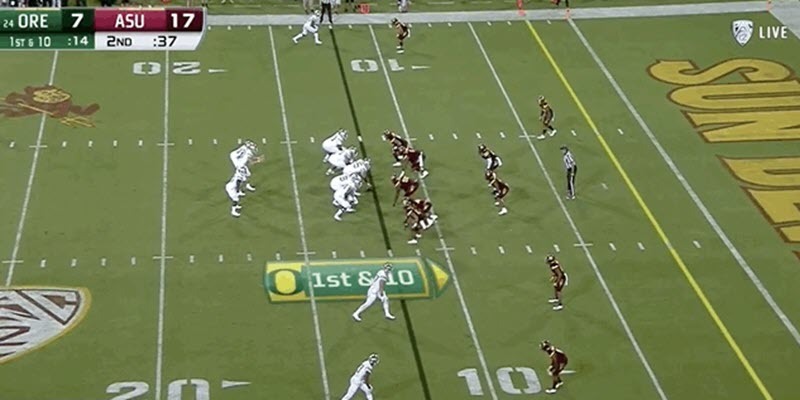 This split will still be used by Cristobal, but if the spring game is any indication, the splits and receiver alignments will be quite variable this fall. The Baylor split puts a new meaning on the term WIDE receiver. In this split, the outside receiver to each side of the formation aligns himself to the outside the numbers, as shown above. The slot receiver splits the difference between the WR and the tackle. This kind of split makes it more difficult for defenses to disguise what they’re doing. It also empties the box, which allows the inside run game to thrive by making it hard for safeties and outside linebackers to cheat inside. The disadvantage of this wide split is that it takes away the ability to run certain routes on the outside, such as outs and corner routes. You can live with this disadvantage considering all of the space it allows your skill players to work in. The Baylor split really forces coverage defenders to play on islands. However, on the first play from scrimmage during the spring game, Oregon went to the extreme opposite of the Baylor split. The formation above deploys a very condensed WR split, or tight slot. This is an alignment that Chris Ault and Jim Mastro used at times at the University of Nevada. This is also a tool Taggart brought to the Oregon program last season. This kind of alignment can also aide the run game. You may think that being condensed like this would clutter the box, and you would be correct. Doing this allows you to pin the defense to the inside and get faster running backs out on the edge with a ton of space. All of this space to the outside can also be advantageous to receivers on outside breaking routes, especially after the catch. A cousin to the tight slot alignment is the bunch tight set. This is essentially trips to one side of the formation, but in a tight alignment, as the Philadelphia Eagles show in the above screenshot. This set almost certainly forces the defense to run a specific type of coverage. The most common coverage scheme for a bunch tight set is known as banjo at the NFL level. 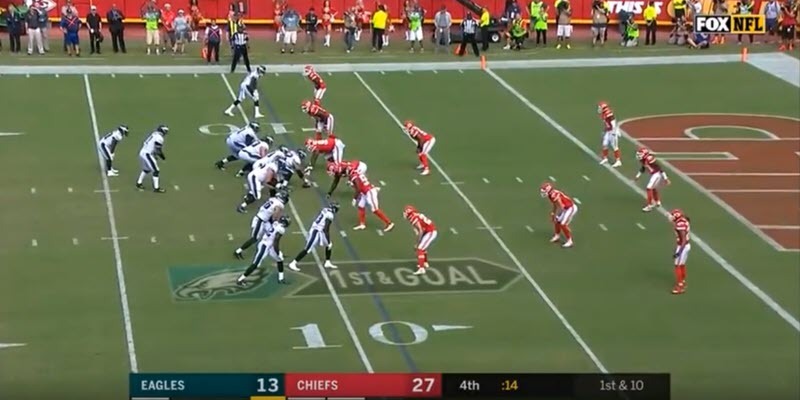 In a banjo scheme, the defense will press the point of the bunch–the receiver lined up on the ball–with an outside linebacker, and have the Nickel and outside CB play ”buddy” coverage. They both will play at about the same depth, one on the outside of the bunch and one on the inside of it. The outside CB will take the first route breaking out, and the inside Nickel will take the first route breaking in. When you know that the defense is going to deploy this type of coverage a majority of the time, you get an upper hand in play calling. The last alignment I want to touch on is the stacks formation above. This alignment allows for the best of both the Baylor split and the bunch tight set. With the receivers stacked the way they are, the defense is forced to empty the box to cover the field. In addition, they have to follow specific rules in coverage so that the don’t pick each other off during the play. 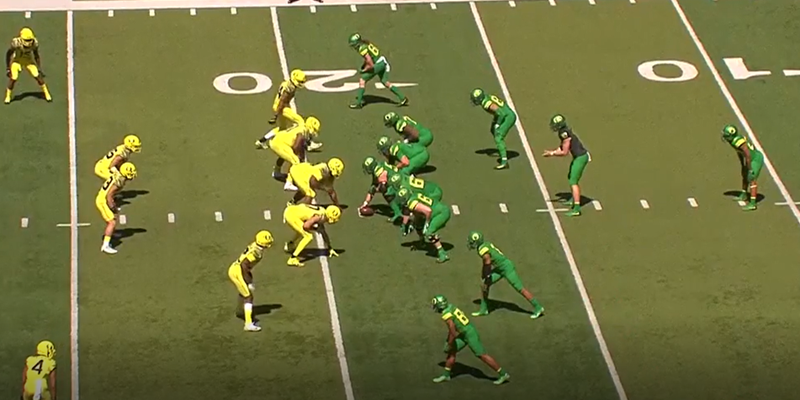 This is an alignment that Oregon used quite often last season. Given its effectiveness, I expect it to stick around. Finally, in addition to all of the above advantages each of these various formations gives an offense, another overwhelming pro is that, together, they make an offense look more complex than it actually is. You can run virtually the same plays from each of these alignments, but because the look different from the start, it gives the appearance of being quite different, which is a headache for a defense, particularly in the back seven. 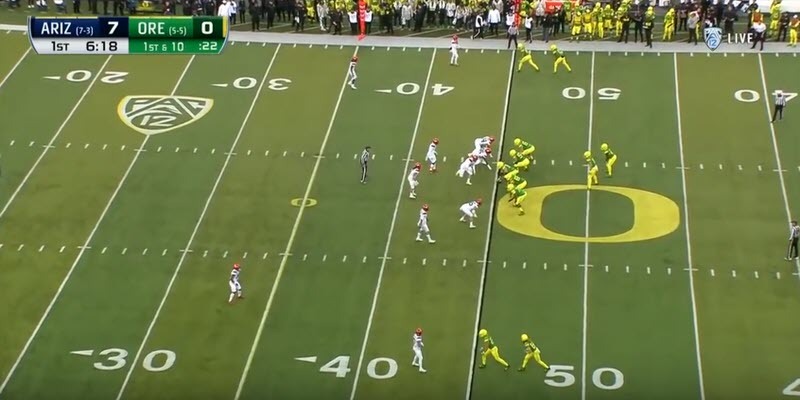 Though I love how Oregon is a base spread offense, I love even more the idea of greater variation in the use of our formations and alignments.